Over the last 15 months I’ve spent a couple thousand dollars on off the shelf escape room props with Evilusions. Brian and Chris have been quick to respond whenever I had a question and have clearly communicated during each transaction. The single greatest reason to buy from these guys is that they get how ER props are handled [ abused ] by guests. You can make them pretty when you get them in your shop, but they are very well built – both the construction and the electronic guts. They sell them plain jane so you can set dress them any way you wish. Even though Brian is highly sought after for his glowing Youtube personality, have no fear, they are all about the business of building props that show up for work every day. Chris and Brian are great people, its a pleasure to work with them. They have made 2 Escape rooms for us and looking forward our 3rd. Quality and service a definite 5 star. I would recommend using them over and over again. No need to look for any other supplier. The best in the industry for Escape Room products to complete rooms. The most durable and coolest looking props you will find, nobody has come close to there quality. Every time we come up with some new crazy idea for our escape rooms there is no doubt that they can make our crazy ideas into reality. I dealt with Brian Warner’s company for the first time in 2010 and I was blown away by the build quality of his props, the timeliness of his delivery and his outstanding customer service. He built two custom animations for our attraction for 2010 with far too little lead time and the results were outstanding. I would encourage anyone to deal with Evilusions. Brian Warner and the Evilusions team are top notch in every respect. They were able to construct two custom animations for us on a super tight schedule (30 days prior to opening) and deliver them on time and to a quality level far beyond my expectations. Brian works each day as an industrial fabricator on multi-million dollar industrial pneumatics. Somehow, he manages to carry that quality level over to his haunt products while maintaining best in industry pricing. Brian has been working with Gore Galore over the last couple years. The engineering of the animations he builds is bar none to most anything offered in this industry. Almost none of the vendors in the haunt industry design anything with bearings, but everything Evilusions sells is built for longevity in mind and comes with bearings and grade 8 bolts. 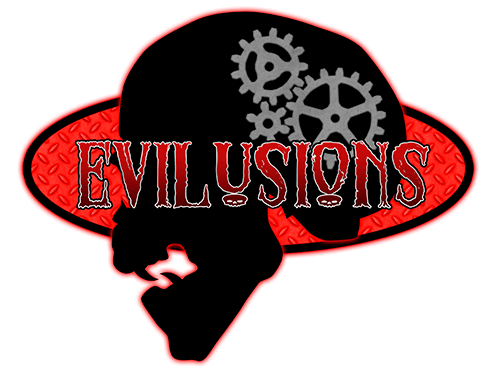 Evilusions provides extensive knowledge in the mechanics of design, construction and installation of all types of props and animatronics specifically geared for the haunt industry. Evilusions provides quality products and excellent product support. If something goes wrong, Brian will fix or replace it. They always make it “right”. Brian has a love of the industry and takes pride in the success of the businesses he supports. We will continue to utilize Evilusions on upcoming projects as they have earned and become my vendor of choice.